As more and more companies have their offices in separate regional, national and international areas, they are requiring new ways to integrate data between all of the remote locations. In addition, with telecommuting becoming commonplace, offering your workers the option to work from alternate office sites or from home will help you attract and maintain a quality workforce and improve productivity as well as employee satisfaction. South Anna Technology configures and monitors networks and workstations for remote business locations. We make sure that your remote locations have access to the main network while maintaining security standards and connectivity. 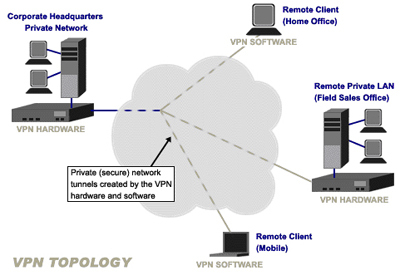 Virtual Private Networks (VPNs) allow you to connect two or more points using the public Internet. While private connections provide the highest level of security available today, they are quite expensive and difficult to implement for small to medium companies because of the high cost. VPNs create a private network tunnel over the public Internet, giving you a secure connection while keeping the costs under control. South Anna Technology can setup secure dial-up or Internet-based Virtual Private Network (VPN) access to your network from anywhere in the world. Remote access gives you the ability to do everything you can do at the office – you will have access to applications, files, network printers, Internet, e-mail, etc. South Anna Technology provides network assessment services to clearly define the customer’s existing environment, understand the organization’s future requirements and develop a strategic plan that guarantees success. We guarantee that engaging South Anna Technology for a network assessment will result in cost savings on future projects, reduced down time and provide the competitive advantage achieved by deploying cutting edge technology. A network assessment allows the design team to effectively utilize existing infrastructure where possible and establish a plan to migrate existing infrastructure components to new technology with minimal impact to the user community. The assessment service also provides a four-year strategic plan to integrate future applications and infrastructure requirements while identifying the costs associated with the enhanced functionality. By gathering information such as topology, protocols, performance characteristics, network numbers, naming convention, equipment brands, revisions, models, network drawings, application information and management components this service will create a clear picture of the customer’s network while pointing out the need for performance improvements or migration to new technology. Since life cycles are rapidly shortening, the financial risk involved in making technology decisions has grown exponentially. We know that the best way to minimize this risk is to perform a network assessment prior to making a commitment to a particular technology or vendor.